Baum first became involved with the organization at the behest of his 14-year-old daughter, Kimberly. Her love of animals was apparently contagious. LightHawk, an environmental aviation organization, was founded in 1979 to provide donated flights by volunteers to accelerate conservation efforts being made by a number of groups around the country, as well as Mexico, Central America, and parts of Canada. Baum transported the endangered ferrets, named Roger and Ari, from the U.S.
Center in Colorado to the Northeastern Wisconsin Zoo. 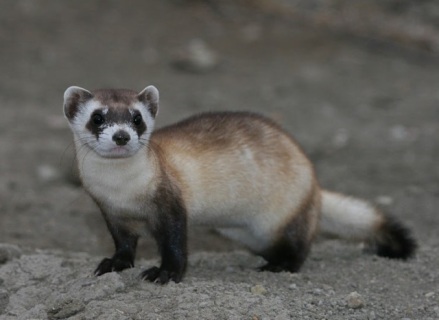 It was an essential mission in the overall plan to restore the ferret population in the U.S.
centers and 19 reintroduction sites. By reintroducing the ferrets back into the wild additional beneficial effects will be extended to more than 130 plants and other animal species. Thanks to Baum and his daughter, Roger and Ari educate zoo visitors on the importance of their species and the importance of restoring their population in the wild. It is their retirement plan after being a part of the captive breeding program for some time. Transporting the ferrets by small aircraft is healthier for the animals than commercial transport. Commercial flights are very stressful for animals with wait times, noises, and being in parts of the aircraft that are not temperature controlled. first chance to transport wildlife. Roger and Ari were perfect passengers and Baum was already making plans for his next trip -- to transport Peregrine falcons from Idaho to New Mexico. These birds were also candidates to repopulate a habitat where their kind has vanished. In spite of the time and costs involved in the operation, Baum still wants other pilots to consider working with LighHawk. It was rewarding for both him and his daughter to play even this small part in the larger conservation effort to help endangered species. For more stories of LightHawk operations to transport animals, click here.